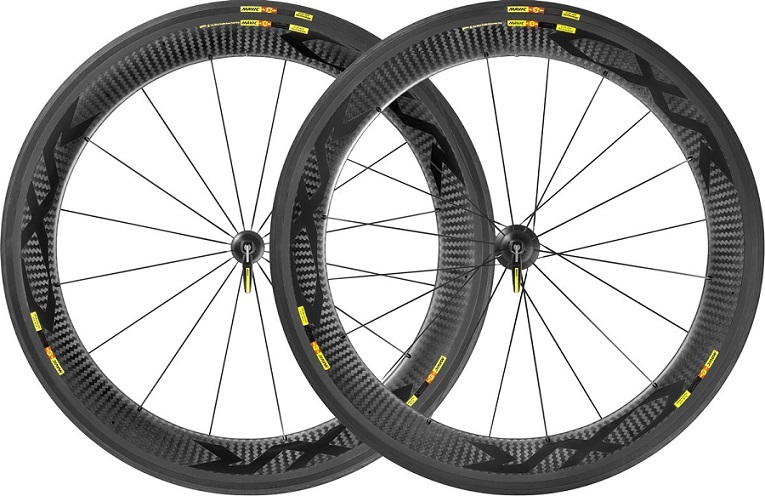 The CXR Ultimate 60 Clincher Wheelset 2016 from Mavic is a wheel-tyre system from Mavic, designed to flow as a single unit, ideal for triathlon, sprints and hilly races. The 60mm clincher wheel-tyre system has the lowest drag and crosswind resistance thanks to the NACA inspired rim-tyre profile. As well as this the 60mm deep dish rim has CX01 blades to unify the tyre and rim for ultimate aero capabilities and low lateral wind resistance. Mavic have also incorporated exceptional stiffness and low weight by using a full carbon rim profile teamed with stainless steel double butted spokes and stiff aluminium axles and large bearings. Available in Black with CXR Ultimate GripLink/PowerLink tyres.